This soup was scheduled for the menu this week, but we used it last Friday instead. It turned out well, so I’m posting the recipe. The bread for the sandwiches came out of the oven and was immediately sliced and toasted. Oh, so good! You can use fresh celery and onion in this if you like. Dice and sweat the amount you want in some vegetable oil or butter and add them to the soup. But I want something fast and easy, so I use alternative ingredients. DH is allergic to onion, so I have to use a small amount of dry onion in recipes rather than lovely fresh onions. Combine all ingredients. Heat and serve. Yummy as leftovers, too, though the pasta breaks up a bit. 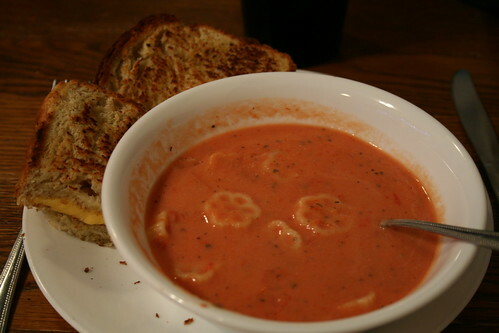 This entry was written by ~~Rhonda, posted on November 9, 2009 at 9:15 am, filed under Recipes and tagged cooking, recipe, tomato soup. Bookmark the permalink. Follow any comments here with the RSS feed for this post. Post a comment or leave a trackback: Trackback URL.